The three posterior thigh muscles, collectively known as the hamstrings, extend the hip and allow for flexion at the knee joint. Often, these eager workers help us pick things up from the floor, allowing us to bend over countless times a day and also pick up the slack for underutilized glutes, a weak core, and tight pecs. These diligent muscles need extra love and patience on the mat, because overstretching can result in stubborn injuries that tend to last for long periods of time (the hammies rarely have adequate rest). Below are five of my favorite yoga poses that safely target the back of the leg without taking you beyond your limits. This therapeutic Standing Forward Fold relieves tight hamstrings and helps maintain a strong and supple spine. Make sure you hinge from the hips rather than bending at the waist as this can place unnecessary strain on the back, resulting in possible injury to the lumbar spine and/or hamstrings. Emphasize lengthening the front torso as you fold forward toward the toes. If you can reach the floor, rest your palms in front of the feet. If you cannot touch the ground, hold onto your elbows for stability. Relax your neck and let the head hang heavy. Hold 10 to 20 breaths. Make your way back to Tadasana by slightly bending the knees and keeping the spine long on the way back to standing tall. I call Triangle Pose “All-Purpose Healer” because not only do you practice balance here by toning the core and internal organs, you also send healing vibes to the furthest extremities. Your whole body will thank you after practicing this asana. Step the right leg to the back of the mat and turn the foot to a 45-degree angle. Extend the arms to shoulder height. Reach the left arm toward the front of the mat while sending the right hip towards the back of the mat, ensuring both sides of the torso lengthen. Keep the left leg straight without locking the knee and place your hand on a block on the inside of the left ankle. As your hamstrings loosen up, you may not need the block and can place your hand on your ankle. Hold 5 to 10 breaths. Bend the front knee as you make your way back into Tadasana. You will stretch your hamstrings as well as your groin in this active pose—just make sure you don’t navigate past your comfort zone as the vulnerable inner knee can take on excess strain if you get too ambitious lowering to the ground. Use your breath as your guide. Begin with your feet wide apart across the full length of your mat. Turn your toes slightly inward for greater release in the hips and lumbar spine. Hinge from your hips as you descend forward, knees slightly bent as you reach toward the floor. Walk your hands underneath your hips, keeping them shoulder width distance apart, and place them in between the feet. Tuck your chin gently toward your chest and lower the top of your head towards the floor. It’s not important if the head touches the floor or not, but do attempt to keep the spine lengthened. Bend your knees to return to standing. 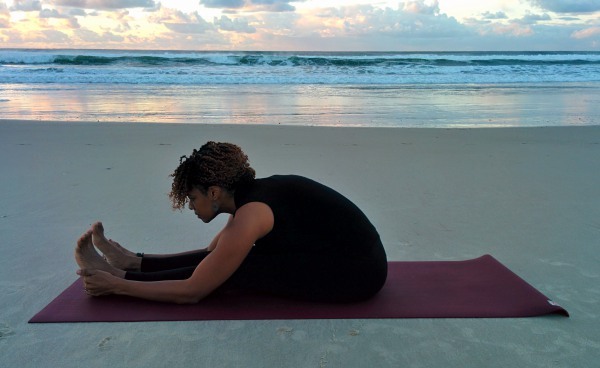 A grounded Staff Pose helps realign the spine and allow the natural curve to exist even during a seated pose. Reaching for the toes in the forward folding Paschimottanasana is more of a detail than the goal; instead, focus on broadening those hamstrings and steer clear from rounding the thoracic spine. Begin in Dandasana with a tall spine and legs outstretched in front of you. Inhale arms toward the ceiling. Exhale reach toward the feet, wrapping your first two fingers and thumbs around each big toe, or resting hands on the shins. Sitting on a block helps make this pose more accessible if tension in the back or hamstrings makes forward folding painfully uncomfortable. Most practitioners find Hanumanasana or full splits inaccessible, which makes this supine version a safer, more enjoyable alternative. Bring the right knee into your chest, holding the big toe with the first two fingers and thumb. Extend the leg up towards the sky, and gradually, breath by breath, ease the foot towards the head. You can use a strap here for a gentler stretch. Avoid lifting the left hip off of the ground by extending through the left heel. Most hamstring tension and back pain results from poor posture while seated. If you experience chronic tightness in your hamstrings, aggressively stretching this area will not make it all go away. When tension regularly hits specific areas, this indicates injury or an inefficient movement pattern in other areas of your body. Hamstring stretches involve Forward Folds, which can exacerbate an already overstretched mid to upper back and a shortened chest from sitting hunched over a computer all day. Forward folding without lengthening the spine can also affect the lumbar region, creating an excessive rounding of the lower back, which severely limits hip flexor mobility. While yoga teaches you to observe and watch for these patterns in your movements and in your practice, ask your instructor for assistance to ensure optimal posture on and off of the mat.